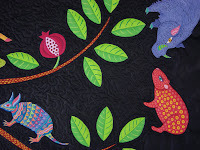 I had to take a break from quilting, my upper back turned into a big cramp, So i have backed way off on the hours at the machine and have been knitting and going to the Illinois Homeschool Conference with the kids. 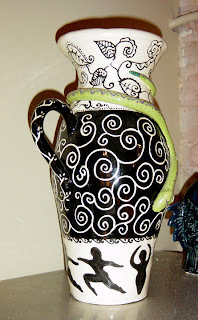 So I will show some of my pottery to keep things somewhat intersting. 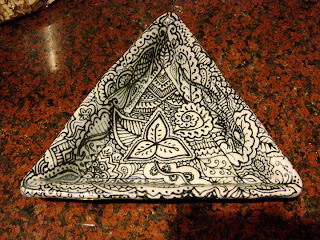 The first pot is a large hand coiled vase, and the second picture is a hand painted triangular bowl. The house is slab built with a drawer that pulls out and a recessed niche. 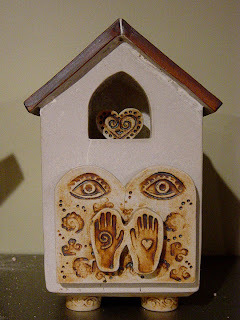 the designs are made from clay stamps that I carved and pressed into the clay. 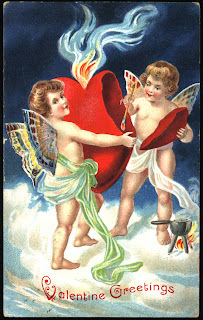 It is painted with iron oxide. 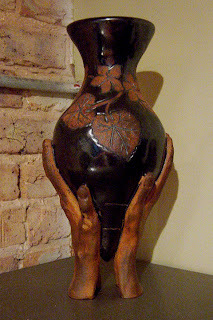 The vase with the hands is a hand built coiled pot that has a carved design painted with iron oxide. 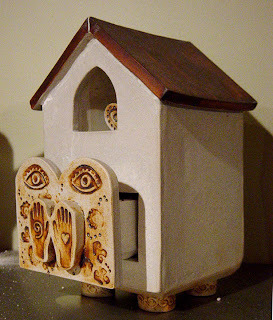 I made a mold of my own hands to create the hands that hold up the pot. 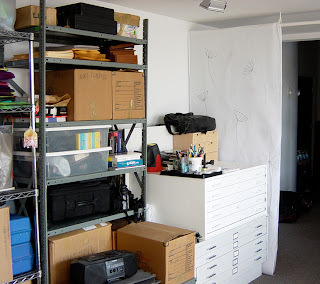 I made this curtain yesterday to block the view of flat files and shelving as you enter our loft. The curtain is a long strip cut from a bolt of buckram that my mother in law gave me a few years ago. The cloth is fairly sheer, so I drew the design on two layers with Sharpie markers. (I see this as a temporary solution to hopefully a temporary problem.) 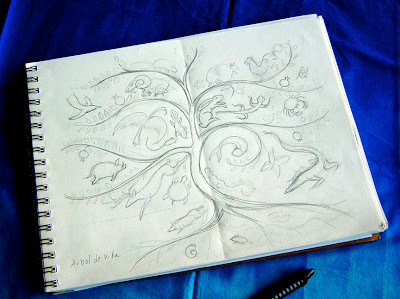 I drew flower designs on the back layer and a tree and bird on the front layer. You can faintly see the flowers from the front, although not too well in the photo. I draped the cloth over the water pipe close to the ceiling eliminating the need for any hanging apparatus. Yesterday my baby turned 17! 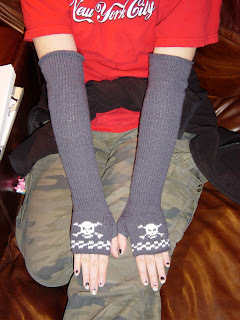 And I gave her the goth insprired arm warmers I made. Perfect considerering it is 2°F right now and she is wearing a short sleeve t-shirt. I refuse to leave the house for the next several days, not until the temperature gets up to at least 10°F! I have never lived some place that had wind chills of -35 before. I expect to see penguins with these kind of temps. Thank goodness Abby is trained to use a litter box, it is supposed to be -10° tonight! 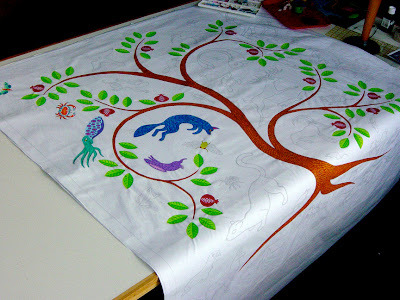 I started this piece with the idea of making a Mexican tree of life quilt. I knew it should be bright, colorful and graphic in style. 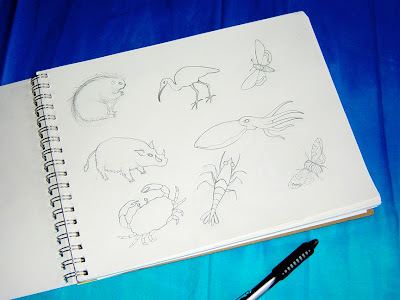 For several weeks I carried my sketchbook with me as I went about our home schooling classes and activities and when I had some time I sat and drew as many different animals as I could think of. Occasionally I would look in books or on the internet to find pictures of animals that I could not draw from memory, like an anteater. I knew these would be stylized animals so I was not going to worry if things looked exactly like real animals, just close enough to get the idea. After I drew a leaf, pomegranate and tree that I was happy with, I scanned all these images into Photoshop. 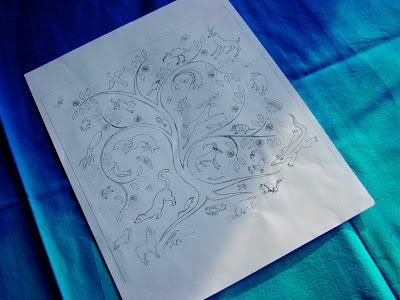 Using the rubberstamp tool I made several stamps of leafs and pomegranates at various angles that I could stamp into positions around the tree branches, all being exactly the same size. 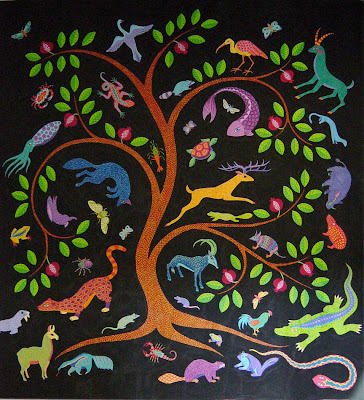 I placed the animals around the tree, sizing them up and down and tilting them into a pleasing composition. Once this was complete I transferred the file to Adobe Illustrator and sized it up to 60 inches square. Then I printed it out on 8 1/2” x 11” paper and taped the sheets together with clear packing tape. 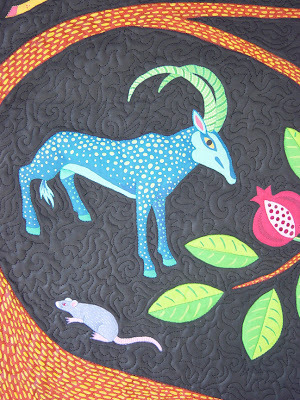 Once it was full scale I made a few adjustments sizing up a couple animals and rotating another to a new position and then I realized I had forgotten to add a snake. How could I forget a snake? I have them in so many of my quilts. 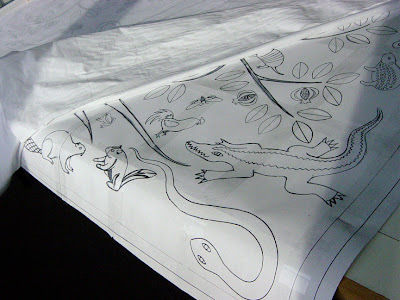 I grabbed the tracing paper, laid it over my drawing and drew a snake to fit in an open area in the bottom corner. I then copied this with a Sharpie onto the final drawing. 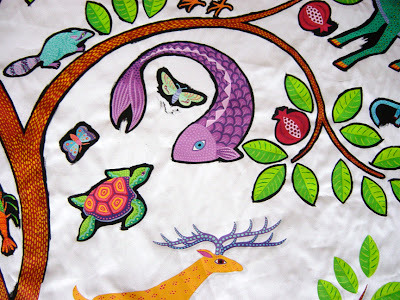 I always use Sharpies on my drawings, because it is so easy to see it through the white fabric. 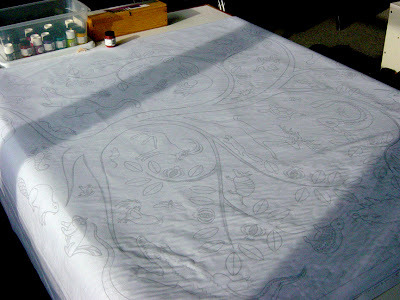 Next I taped the top edge of my fabric (regular bleached white PDF cotton) to my drawing and LIGHTLY traced the design onto the fabric with a thin lead mechanical pencil. 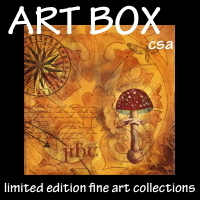 I use Jaquard and Pebeo Setacolor brand textile paints. I mostly used Jaquard opaque paints for this quilt. These paints do not spread on the fabric if you use them the consistency that they come out of the jar (thick creamy) on cotton fabric. Sometimes as the paint sits and starts to dry in the dish while painting I will add a little water, or moisten my brush but usually no extra water is needed. 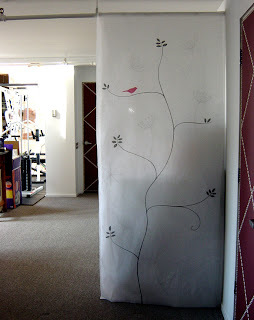 I leave my large paper drawing underneath while painting to protect my table and if I want to make any changes or additions to the design it is easy to add it in as I go. 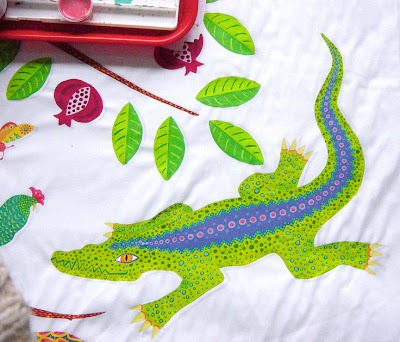 I paint straight onto the fabric on the table. 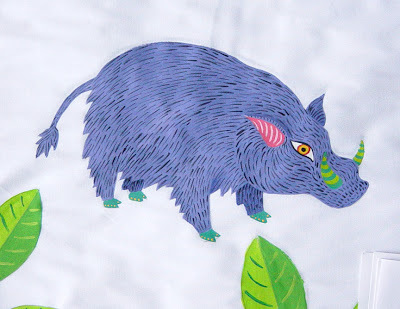 The paper sometimes sticks to the painted fabric so if you don't want to occasionally pick paper off the back of your fabric paint on a covered surface. I like to use dry cleaner bags because they are so thin they will not make bumps under the fabric. Painting over a textured surface will show up in the paint. When it came to painting the black, I used a tiny brush and carefully painted around each animal about a quarter inch, then filled in the background. 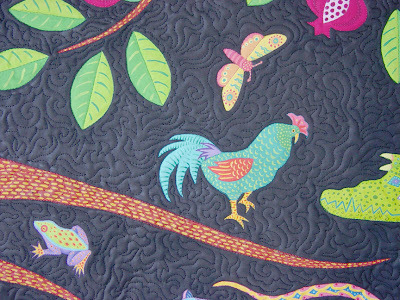 My new Ipod played a key role in the making of this quilt. Because of the detail and precision this painting required I knew I needed something to keep my mind active and engaged while I painted endless hairs and dots. I listened to 7 audio books while painting this quilt. Three of those books totaled 53 hours. Every hour of painting was wonderful.